On Saturday May 8th, a 13-year-old St. Regis Falls Central School baseball player died. The boy, Brady Lee Frazier died five days after he was hospitalized with a head injury suffered while playing baseball with the school's modified team. The eighth-grade pitcher was hit in the head by a line drive during a practice session. I have been blogging since March and this is the third story that I have reported. Last year one of my friends son's was seriously injured by a line drive while pitching. So I have to ask this question. 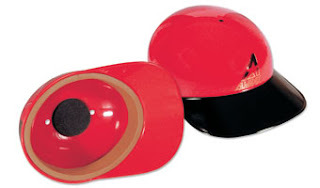 How many more kids need to die or be mamed before helmets are required for pitchers? No governing body seems to be establishing safety rules, but coaches can certainly mandate that their players must wear fielding helmets. The sad thing is, it is not easy to find protective gear that fits these smaller frames. I have been anxiously waiting for Easton-Bell to release their "dome" protective cap for nearly a year. In the mean time, the skull caps are our best option and are often only offered in adult sizes. Don't manufacturers see the demand here?? ?